are looking for, try the search box at the bottom of the page. Payments accepted via check, money order, or credit cards via PayPal! 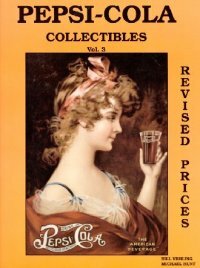 This is James Ayers' second volume. 169 Pages - all color with enlargements. Printed on heavy glossy stock with spiral binding. Slice, Teem, Tropic Surf and others. 55 Mountain Dew competition bottles and cans. 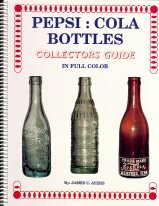 HARD BACK Edition -- 8.5" x 11"
Dr Pepper, 7-Up and more! 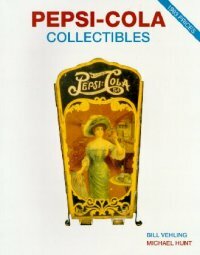 148 pages of Pepsi-Cola related collectibles. 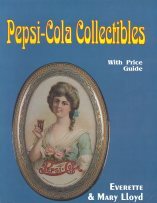 Book contains 1993 price guide. Black and White photographs. 8.5" x 11"
Out of Print - But I have a few copies! 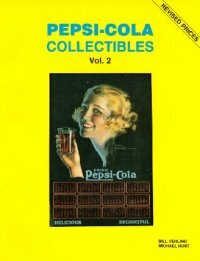 192 pages of Pepsi-Cola related collectibles. Completely different items than are found in volume one!!! Paperback Edition. Black and White photographs. 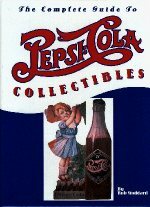 8.5" x 11"
156 pages of Pepsi-Cola related collectibles. Completly different items than are found in vols. I and II. The final volume of this terriffic set! 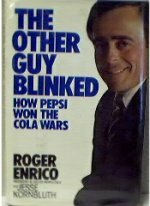 Book contains 1995 price guide, Paperback Edition. Spiral Bound, Glossy Color, 144 pages, 2002 Price Guide. Cooking With Pepsi, Uh Huh! : You Got the Right Ingredient, Baby! Not sure if this book was ever published. Photo wanted! If you can help, please email me!